Musings on Markets: The School Bell Rings! It's Time for Class! My biggest fear is that someday you will announce your retirement. I pray that you never retire. If you do so, at least I hope you keep writing books. Thank you very much Prof Damodaran. I came across your work in 2013 for the very first time. Since then I have followed your work religiously. In the process I have learnt a lot and I have developed a much more pragmatic view of finance and valuation.I look forward to follow through this class like the others that have passed. I really enjoyed your Google Tech Talk on valuation. I also shared it with my parents, and they enjoyed it as well. 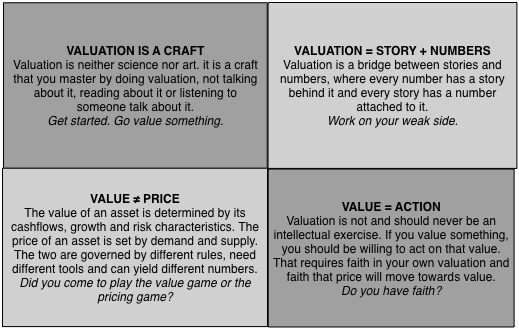 On the practical side, you outline a clear framework for thinking about valuation, which was instrumental in helping me negotiate a job offer at a (very) early stage startup. Thanks! Great stuff, Prof! Keep up the good work as always you do. Thank you. A question: I know you also have a keen interest in seeing the disruption in education. I have wondered though whether it will ever happen. To drive the point, you have rightly mentioned that you won't be able to grade and more importantly give a certificate of completion for the course. While knowledge is no doubt gained, nothing is posted on the candidate's CV. In these circumstances, how will the candidate be able to find a suitable employment? Same is true with every other subject that is offered in universities. Unless one pays up big dollars, a good CV cannot be created. Where's the disruption? Isn't this a sorry situation for someone who has gained knowledge but not degree? There is always a story and there is always a price and what does the price say about the story? McDonald's (MCD) pays a 3% dividend, that looks really interesting in this near zero percent savings environment. But is the market price of McDonald's (currently $116.92) a fair valuation. When I run the numbers and I give MCD a growth rate of 1% I get a share price value of $67.21, if I bump up the growth rate to 5% I get a value per share of $87.75. MCD has had nearly zero growth over the past five years and the market is giving MCD a growth rate of 9.5% over the next five years. Knowing how to construct the numbers (thank you Dr. Damodaran!) gives me an indication of what story Mr. Market is giving me and I find the story too rich for me so I am passing on MCD, even if the new CEO is very good for the company, I find it hard to believe he can grow MCD nearly 10% a year over the next five year. Even though I am disappointed in not getting the 3% dividend I am happy to know I would be paying too high a price to get that 3% dividend. Hi Prof Damodaran, I am unable to download the 1st part (discounted cashflow valuations) of your lecture note which is supposedly updated. Looking forward to listening to you soon.